Grand Challenges Explorations funds individuals worldwide to explore ideas that can break the mold in how persistent global health and development challenges are solved. Lieberman’s project is one of more than 50 Grand Challenges Explorations Round 12 grants announced Tuesday (June 3) by the Bill & Melinda Gates Foundation. To receive funding, Lieberman and other Grand Challenges Explorations Round 12 winners demonstrated in a two-page online application a bold idea in one of five critical global heath and development topic areas that included agriculture development, behavior change and looking into animal and human health. Applications for the next round will be accepted starting in September. Lieberman’s team has designed an inexpensive paper test card that can detect low-quality medications and apply economic pressure to companies that manufacture or distribute them. The World Health Organization estimates that 10 percent to 30 percent of human medications are of poor quality and an unknown percentage of animal medications is substandard or falsified. There is little chance that poor quality products will be caught by pharmaceutical buyers or drug regulatory agencies in developing countries, because it is so expensive to collect and test them, so low-quality products continue to harm both people and animals. Lieberman’s team will design a test card to monitor 50 types of human and animal medicines. Testing a sample of a medication is economical and accessible as there is no instrument to purchase, and the results of the test card can be read by eye or with a cellphone photograph. The test cards will enable people who buy large quantities of human or animal medications to steer clear of low-quality products and will help regulators to hold companies responsible for the quality of the medications they sell. Grand Challenges Explorations is a $100 million initiative funded by the Bill & Melinda Gates Foundation. Launched in 2008, more than 950 people in more than 55 countries have received Grand Challenges Explorations grants. The grant program is open to anyone from any discipline and from any organization. The initiative uses an agile, accelerated grant-making process with short two-page online applications and no preliminary data required. Initial grants of $100,000 are awarded two times each year. Successful projects have the opportunity to receive a follow-on grant of up to $1 million. 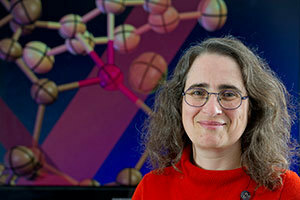 Lieberman is a member of Notre Dame’s Eck Institute for Global Health, which funded her initial exploratory research. She has partnered with the Academic Model Providing Access to Healthcare (AMPATH), which consists of Moi University School of Medicine and Moi Teaching and Referral Hospital in Eldoret, Kenya, and a consortium of North American academic centers. She has also partnered with Sidai, which provides quality services to livestock keepers across Kenya. Her work is also supported by Notre Dame’s Advanced Diagnostics and Therapeutics, which provides diagnostics for the developing world. The PAD project is an evolving collaboration with Toni Barstis, professor of chemistry and physics at Saint Mary’s College, and with Notre Dame professors Holly Goodson, Patrick Flynn, Christopher Sweet, David Go and Matthew Champion. Originally published by Marissa Gebhard at news.nd.edu on June 03, 2014.